A teenager got his car wedged between two trees. 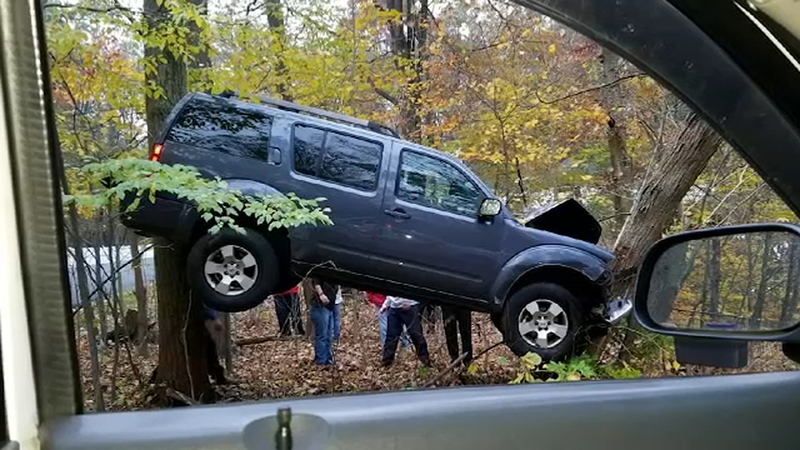 HAPATCONG, New Jersey (WABC) -- A New Jersey teenager wedged his SUV between two trees without remembering how it happened, police said. The 17-year-old drove the SUV off of Sparta Stanhope Road in Hopatcong Thursday and landed between two trees, suspending the car four feet above the ground. Police said the teen was listening to music while driving, and the next thing he remembers is seeing the hood of his car bent in front of him. Police discovered that his vehicle crossed double yellow lines onto the other side of the street before veering off of the road entirely. The Hopatcong Fire Department rescued the uninjured teen from the SUV after securing the vehicle with chains. Police do not know what caused the driver to crash into the trees and found no evidence that the teen applied the vehicle's brakes during the accident. A tow company was able to lift the car out from between the two trees.